Look up linhay in Wiktionary, the free dictionary. Circular linhay in Braunton in Devon. This linhay is located near drained marshland. Braunton Burrows is visible in the background. 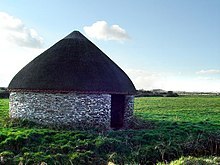 A circular linhay is an ancient type of structure found in England, particularly associated with Devon. Linhay (rimes with finny), also spelled linny and linhay, is a type of farm building with an open front and usually a lean-to roof. In Newfoundland English a linney is similar as a storage space, kitchen, or porch but as an addition to the rear of a house, and in American English it is an open, lean-to shed attached to a farmyard. Linhays were used to store hay above and shelter cattle (cattle linhay) or farm machinery (cart linhay). ^ Story, G. M., W. J. Kirwin, and J. D. A. Widdowson. "Linny" def. 1. Dictionary of Newfoundland English. Toronto: University of Toronto, 1982. 306. Print. ^ Whitney, William Dwight. "Linhay" The Century dictionary; an encyclopedic lexicon of the English language,. vol. 4. New York: The Century Co., 188991. 3,467. Print. Wikimedia Commons has media related to Linhays. This article about a Devon building or structure is a stub. You can help Wikipedia by expanding it.